Our 34-Piece Jumbo Pack is for extreme puzzle addicts only. Combining two Classic Edition 13-piece sets and one 8-piece, the Jumbo Pack has stumped several world-leading mathematicians! 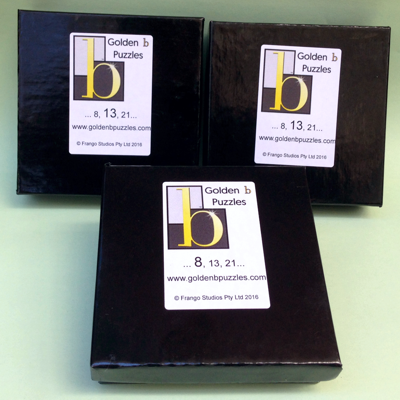 The Jumbo Pack is actually four Golden b Puzzles in one: as well as the 34-tile mega-puzzle, you can solve the slightly easier 21-piece, 13-piece and 8-piece versions. So a single Jumbo Pack will provide hours, days, weeks and years of fun for the whole family. 34 tiles mightn’t sound like a lot, but the 34-Piece Jumbo Pack is mind-meltingly difficult. Are you up for the challenge?